Iron Dome shoots down two rockets fired from Gaza towards the Hof Ashkelon region, just after three Gaza rockets exploded in Eshkol. The Iron Dome anti-missile defense system on Friday evening intercepted two rockets that were fired from Gaza towards the Hof Ashkelon Regional Council in southern Israel. The attack on Hof Ashkelon followed a barrage of three rockets that were fired by Gaza terrorists and exploded in the Eshkol Regional Council. All three rockets hit open areas, resulting in no physical injuries or damages. Earlier, a mortar shell was fired from Gaza and exploded near the border fence, in the Kissufim area. No one was hurt. Friday evening’s rocket attacks came after an Israeli air strike targeting a car in the Gaza Strip killed two terrorists in the afternoon. The IDF identified the two dead terrorists as Osama Hasoumi and Mohammed Fasiah, and said they were targeted for their involvement in recent rocket fire against Israeli communities in the southern Negev region. The pair were traveling together in a car when they were targeted in an Israeli Air Force strike. Terrorists in Gaza have stepped up their attacks on Israel since Hamas terrorists kidnapped three Israeli teens two weeks ago. On Friday morning, a bomb exploded near troops manning Israel's security fence. The blast went off as an IDF patrol passed through the area, in what apparently was a targeted attack. IDF reports that no soldiers were injured, although light damage apparently was inflicted on an army vehicle. 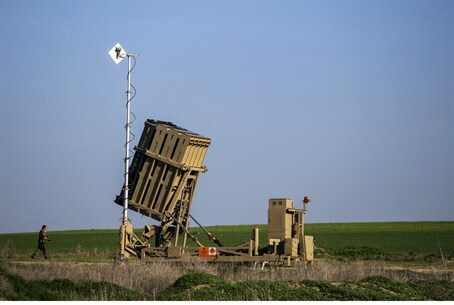 The IDF placed Iron Dome anti-missile defense units on the coastal region near Ashdod and Tel Aviv last Wednesday, in anticipation that terror activity from Gaza may flare up. The Iron Dome, which has been very successful in intercepting rockets before they hit populated areas, also intercepted two rockets fired toward the Ashkelon region earlier this week.